Many of us grew up in a generation where learning to type was a serious endeavor. I learned typing in a year-long typing class where you not only learned the keyboard but learned how to type letters, papers, memos, envelopes and more. This course was a prerequisite to college where you assumed you would by typing papers. Typing on an iPad is pretty intuitive. Most of us can convert our typing experience to the on-screen keyboard on our iPads. However there are a handful of tips the will facilitate the conversion. These tips include hidden shift key and caps lock tips, dictation and managing the cursor. 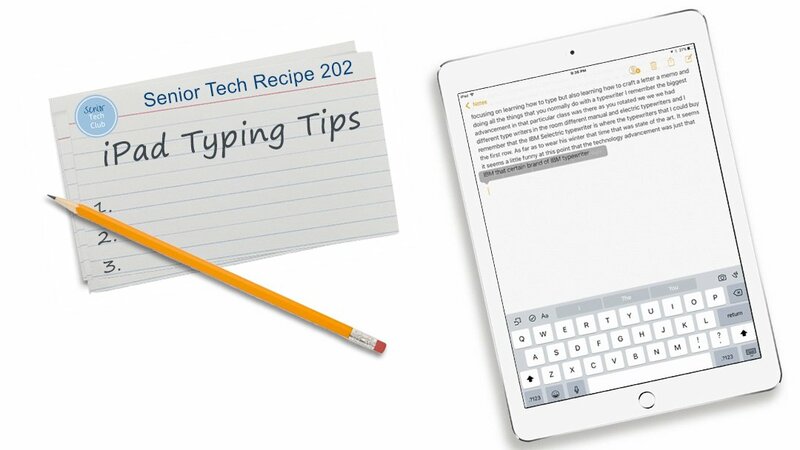 Here are twelve tips to improve your iPad typing. The number of the keyboard below references the tips with the same number. Use a larger keyboard by changing the screen orientation to landscape. You still can choose whether you type with ten fingers or one finger! Most people find the landscape keyboard easier. The iPad will automatically place a capital letter in the first word that you type where appropriate, for example, the first word in a sentence and a field where you type your name. Just let it happen. It is amazingly smart. Place the keyboard in Caps Lock by double tapping the Shift key. You will see an underline under the up arrow when in Caps Lock. Return by double tapping again. The iPad will end a sentence with a period if you press the space bar twice. To quickly access a single number or single symbol, press and hold the Number key and drag to the desired key and release. The keyboard immediately returns to the character mode. The press and drag also works with the Shift key. If you see a word underlined in red, tap it to see spelling corrections. If the word you want doesn’t appear, type the correction. Hide Keyboard. Tap to hide the keyboard. Click in the note or document or field to have the keyboard reappear. Use the Backspace key to erase text to the left of the cursor. See managing the cursor below to learn more about moving the cursor. Dictation may be one of the biggest and most useful surprises of the iPad. Practice a little and you may find yourself sending emails that are dictated rather than typed. If you are editing text that you previously typed, you will need to tap on the text that you want to edit so that you can backspace to remove and retype. However it is sometimes difficult to position the cursor exactly where you need it. Here is a hidden trick to position the cursor exactly. Touch and hold the text to show a magnifying glass. Then drag your finger to position the cursor at a different position. The Notes app is a great place to practice typing. Here are the steps to use the Notes App. Tap the Notes app found on your home screen. 1. Tap the Compose icon to create a new note. 2. Type in the Note box. 3. Press Delete/Trash to discard when finished practicing. Change the orientation of your iPad between landscape and portrait to determine your preference. Type a short sentence and type two spaces at the end. Notice how the iPad automatically capitalizes the first word and add a period at the end. Explore typing numbers and symbols. Misspell a word and press the space bar. Notice the red underline. Tap the underline to see spelling corrections. Move the cursor by tapping and holding on a location and dragging your finger. Do you know how to put the iPad on Caps Lock so that all characters are in upper case? Can you describe what the iPad will do to help typing sentences in regard to the first word in a sentence and the end of sentence? The iPad does a good job with dictation. How you get punctuation marks. How can you move the cursor to a specific location.